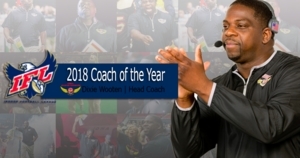 DES MOINES - Iowa Barnstormers Head Coach, Dixie Wooten, was named the Indoor Football League's 2018 Coach of the Year, the League announced today. For a second consecutive season, Iowa Barnstormers Head Coach Dixie Wooten has been named the IFL Head Coach of the Year. In his second season with the Barnstormers, Wooten guided Iowa to the team’s first playoff victory since 2009 and the team’s first ever United Bowl appearance, also marking the team’s first Championship appearance since 1997. Under Wooten’s supervision, the Barnstormers continued to showcase a dominating defense, holding teams to an IFL-lowest 35.3 points per game. Coach Wooten once again put together a team packed with powerhouse players. Wooten’s Barnstormers’ racked up nine total IFL “Player of the Week” honors throughout the season with eight total players being named as All-IFL selections at the end of the season. QB Drew Powell, WR Brady Roland, LB Zach Allen, DB Bryce Enyard, and DL Keith Jones, Jr. were named as First Team selections, while OL Brandon Haskin, OL Ken Van Heule, and DB Jourdan Wickliffe were named as Second Team selections. Along with Wooten’s Coach of the Year Award, DB Bryce Enyard earned Defensive Player of the Year while QB Drew Powell was named Most Valuable Player.